Play Arts Final Fantasy VII 7 Advent Children Kadaj figure. Condition is Used. Figure is complete in box. FINAL FANTASY XIII (13) HOPE ESTHEIM Figure Play Arts Square.Never been removed from box.In good condition but there is some yellowing discolouration on box,see photos.Figure around 8 inches tall. Dispatched with Royal Mail 2nd Class signed for. 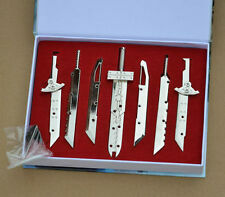 Imported from Japan Rare - Final Fantasy Trading Arts Blind Boxed Chosen at random but posted flat packed. One Piece FREE UK Post. Final Fantasy Creatures New FF VII VIII IX X. Condition is New. 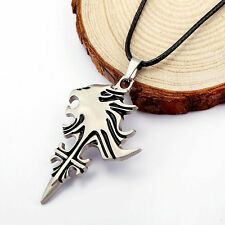 Animation Final Fantasy Vii Pendant Set Condition is New. Dispatched with Royal Mail Signed For® 1st Class Large Letter. In good condition as can be seen in photos. International postage is available via ebay global shipping scheme. Discount on postage for multiple items. Full price for first item and £1 per item after. International bidders wanting to combine shipping must contact us before purchase. Postage cannot be combined if this is not done. Good condition figure however box is in poor condition item comes with hand to hold sword and an open hand and a pair of clenched fists only other 2 spare hands missing. Kingdom Hearts Bundle Of 6 Keyrings . Griever, Yuna Floral Fauna ( ffx-2 dress sphere ), Seymour, Dragon. Tiamat, Bomb, Alexander, Bahamut, Safer Sephiroth. 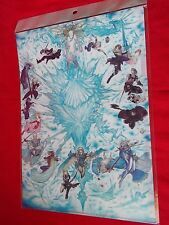 I'm selling the Final Fantasy XIII Trading Arts Vol. 1 figure set, purchased from the SQEX UK online store. Final Fantasy VII (7) Collectible Edition. Final Fantasy Original Toys by Ban Dai. Clouds base is Missing. All other accessories included. Final Fantasy VIII No.1 Squall Leonhart. These have been in the attic for many, many years. They feature characters from 7, 8 and 9 in both colour and crystal form. New and sealed. Final Fantasy VIII five character Keychain. Condition is Used. 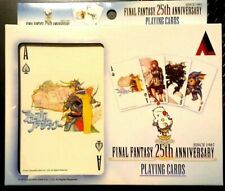 Bahamut Opus 8 Card Sleeves Prerelease Promo SEALED Final Fantasy (FFTCG). Condition is New. Dispatched with Royal Mail 2nd Class Letter. 1pc x Plush toy. Material: Plush. Type: Soft Toys. If collecting in person, then cash upon collection is required. Final Fantasy IX Figures Dioramas. Pretty rare item - 2 original Banpresto dioramas from 2000, only found in claw machines in Japan. 2 dioramas - Zidane and Dagger at Lindblum Castle and Zidane and Steiner in fighting poses. Both sealed in original boxes. Zidane and Steiner box has slight cosmetic damage on the front of the box (shown in photo) A must have for a Final Fantasy IX fan! FINAL FANTASY OPUS 8. 48 PLAYSETS-TOTAL OF 288 CARDS. This strap is 10000% authentic & official, bought direct from Japan myself when released! Outer box was opened to see which strap was inside. Final Fantasy IX Vivi Plush. Official Made By Square Enix. (Size: Approx 5cm in height. 1) Copy the item number. Country: Japan. This is a Square Arts Final Fantasy VII 7 Advent Children Cloud Strife Figure. Figure is preowned but complete in box. (1) Copy the item number. Country: Japan. Release Date: 2007. Cloud strife figure. Condition is Used. Dispatched with Royal Mail 2nd Class. Rinoa, Zidane, Yuffie & Ace. All New Sealed Boxed. It's height is 31 mm. (FFVII Logo Pin. Hurry up!). 2cm x 4.5cm. Final fantasy advent children figures. Condition is New. Play Arts Final Fantasy 7 Advent Children Sephiroth. Condition is Used. Dispatched with Royal Mail 2nd Class.